This month's Minerva Craft Blogger Network project is an easy peasy skirt. All that's required is a rectangle of fabric and a length of elastic. And what's more I'm going to show you how to make it. The decision to make this skirt was made when I bought a couple of metres of awesome two inch wide polka dot elastic from Walthamstow market. I was with So Zo, who was looking for wide elastic to make her husband some undies. I spied it amongst the selection and had to have it, despite having no clue what to make with it. Whilst I was thinking of clothes to take with me on holiday last month, I realised I needed a simple skirt I could pull on over a swimsuit and suddenly thought of the perfect use for my elastic. A gathered skirt with an elastic waist may not be everybody's idea of fashionable elegance - whilst I was researching methods of making it, 90% of the skirts I saw were for toddlers… But for a quick, easy holiday make they're great - no fiddling with fastenings at the pool and comfortable to wear over a swimsuit. Yes, I know summer's over now but I got my months mixed up when I was planning my Minerva sewing projects so here it is now in sunny er September! Like the idea? Good, here's how to make one. *I chose a cotton jersey for my skirt as I wanted a stretch version, but this would work equally well with a cotton woven too. 1. First you need to measure your hips. Multiply this measurement by 1.5 and you have the width of your fabric. My hips are 37 inches, so the width of my fabric is 56 inches (I rounded it up). Then decide how long you want your skirt. I wanted mine pretty short, so the skirt in the tutorial is 19 inches long. 2. Finish one of the bottom edges of the rectangle (I overlocked mine). Turn up ½ inch, press and hem. 3. Fold the rectangle of fabric in half widthways with right sides together, so the two shorter edges meet. Sew this seam using a half inch seam allowance. You now have a tube skirt! EDIT: As I used a knit fabric for this tutorial, I didn't need to finish the top edge of the skirt, if you're using a woven fabric, you may wish to finish the top edge now to prevent fraying. You can finish it using a zigzag stitch, an overlocker or simply turn and hem. Thank you to Scruffy Badger for bringing this to my attention, you can see what a finished top edge looks like on her post here. 4. Sew a row of long, gathering stitches along the top, unhemmed edge of the tube (don't backstitch at each end!) Divide your tube of fabric into quarters with pins. I did photograph this step but you can't really see anything so you'll just have to imagine it. 5. Now we need to attach the elastic. Measure your waist, add ½ inch and cut the elastic to this measurement. Sew the two ends together with a zig-zag stitch using a ½ inch seam allowance. Press open. You may also wish to backstitch a few times for security. Divide your elastic into quarters with pins. 6. Put your skirt and elastic together - you want the wrong side of the elastic to face the right side of the skirt. There will be a lot more skirt than elastic at this point. Your goal is to match up the four pins on the elastic with the four pins on the fabric tube. Gently pull up your gathering stitches so that the fabric is evenly distributed. Pin together using as many pins as necessary. 7. Sew right around the waistband with a zig-zag stitch, keeping close to the bottom edge. Ta-da - you have yourself a skirt! 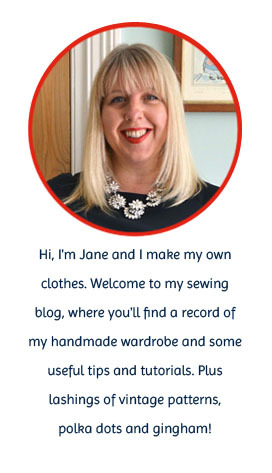 Just a quick blog housekeeping post to let you know that my blog domain name is now www.handmadejane.co.uk. Obviously I would have preferred .com but the domain name was only available for upwards of $700!!!! Eh no, I didn't want it that badly! Blogger will redirect automatically from www.handmadejane.blogspot.com. I have to admit, I don't have a clue about this sort of thing, it's my friend Sarah who's been doing all the donkey work - thanks Sarah! There have been a few teething problems which I won't bore you with, but hopefully they'll be ironed out soon. Thank you to everybody who entered the The Liberty Book of Simple Sewing giveaway - I'm really pleased so many of you liked the look of it. I had no idea cloud cushions would prove so popular! Good afternoon. I have a real corker of a craft book to share with you today, oh yes! If you're a lover of Liberty print fabrics and want to add a few stylish touches to your home, then you may want to take a look at The Liberty Book of Simple Sewing, published this week by Quadrille Publishing. ... to the more unusual (pet beds and dog leads, bike seat covers, rag dolls and covered letters). but some that demand quite a few different techniques such as inserting a zip, quilting and applying bias binding to corners. The complexity of some projects in the latter category could be a little daunting to a total beginner. For this reason, I think the book may have benefited from having a difficulty rating at the beginning of each project stating just how simple the project is (or not as the case may be). Many of the projects use simple strips, squares and rectangles of fabric, requiring nothing more taxing than measuring dimensions. For other projects, templates are provided which have to be enlarged from anything from 120% to 400%. And for larger patterns you're required to scale the patterns up on dressmakers paper. This is my only major gripe with the book - who on earth is going to be bothered to do that? I really wish the book had included a set of full scale templates and patterns. Even one large sheet with different templates in different colours (like you get in Burda Magazine or in a Japanese sewing book) would be an improvement. At least then you'd have something you could work with immediately, even if it is a pain to trace it. Despite this, there are plenty of projects that could easily be undertaken without having to make a special trip to the photocopy shop - 14 in fact. And the instructions are well explained and clearly illustrated. I particularly like the way the book shows you how to achieve a little taste of Liberty style without going too over the top, such as adding strips of fabric to the hems of curtain panels or pillow cases or covered buttons and a belt to a raincoat. Now, I've actually done this exact thing for a friend of mine. Not with Liberty fabric unfortunately (although I really wish I'd thought of that), but I changed her old raincoat buttons for covered ones and made some matching bias binding for the cuffs and neck edge. 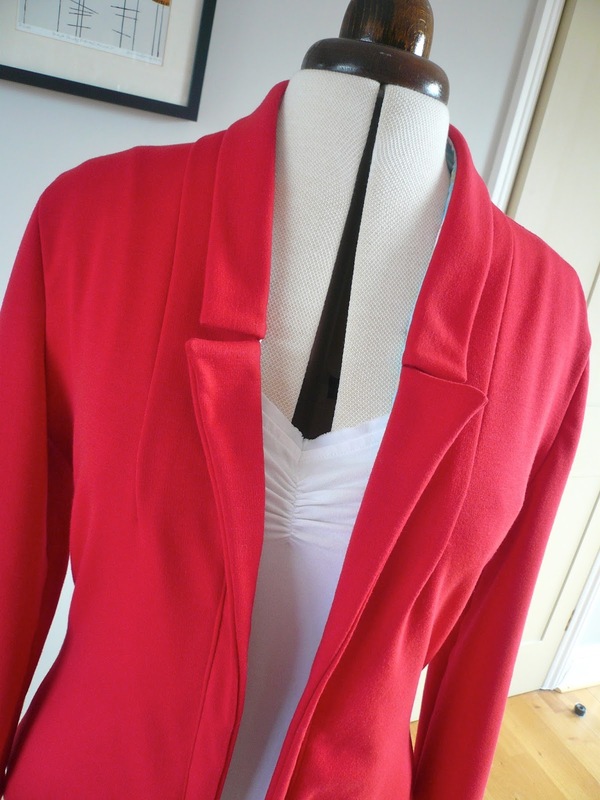 It's a great introduction to refashioning if you don't have much sewing experience. With this book as a guide, you can even make a co-ordinating dog lead! Overall, I think the Liberty Book of Simple Sewing is very inspirational. You can't fail to be inspired seeing achievable home projects made with such beautiful fabrics. The fabrics really are beautiful and it's a pleasure to read because of this. The book would make a lovely present, especially for somebody new to sewing looking for stylish ideas. Well, the good news is, I have a review copy to give away to one of my readers! Yippee. The Liberty Book of Simple Sewing was given to me free of charge for review. All views my own. I'm a bit late to the By Hand London Victoria Blazer party I'm afraid. So late in fact, that everybody's gone home and there are just a couple of passed out drunks left in the front room. Never mind eh?! I had planned to make it earlier, honest Injun, but the freakishly hot weather we've been enjoying in the UK this summer made it impossible to even think about sewing a blazer. So down the queue it went, but not too far down, as I knew it would make a fab autumn project. It's now autumn, the days are rapidly cooling down and my jacket is finished, never say I don't stick to my plan! Shamefully, I showed absolutely no imagination with this make and just went for a blatant copying of Roisin's lovely red version. As soon as I saw hers, I knew I wanted a red one too, only in double knit (I got my double knit from Calico Laine. Mine has even got the same lining as Roisin's! After I enthusiastically admired her lining fabric, Roisin, angel that she is, promptly sent it to me! I love that girl. No honestly, I really, truly do! As wonderful as all the cropped versions are, I just knew a cropped jacket wasn't for me, so I went for the longer length - version A. Except on my midget frame it was a bit too long (god, make your mind up Jane) so I shortened it by two inches. Changed the shape of my lapels from square to angled at the bottom, using this easy tutorial by The Quirky Peach. Tapered the side seams in quite dramatically (more on this later). Omitted the pockets. The jacket started life with pockets but they pulled down in a strange way, maybe the double knit was the wrong weight? So off they came. Size-wise I made a UK size 8 - this is smaller than my measurements but I wanted to allow for the extra stretch of the double knit. As the whole sewing world has already declared, this pattern is a delight to sew. Really easy and straight forward and a perfect pattern to try if you're tackling your first jacket. And the sleeves!! Oh the sleeves were a dream to set in, they went in FIRST TIME, without a word of complaint. Lovely, lovely sleeves. I also understitched the lapel and collar seams to help them lay flat (a tip from Marie at A Stitching Odyssey) and sewed the shell and lining armholes together to prevent the lining from peeking out underneath the blazer shell (a tip from Sally at A Quirky Peach). I sewed the main seams with my overlocker and everything else on my sewing machine with a jersey needle, which worked a treat. The original boxy shoulders and roomy fit were a BIG departure for me style-wise and once the jacket was sewn up, I had to admit, the style just didn't work for me. I absolutely LOVE this style on other bloggers, just not on me. Let's face it, if a boxy jacket didn't work for me as a teenager in the 1980's when I was in my prime, it wasn't going to do me any favours 30 years later. I wouldn't admit defeat though - no way! - a quick tapering in of the waist and the whole look of the blazer was quite a bit more fitted and 100% more me.